Fighting for their finals lives, Yarragon put on a batting clinic against the second-placed Ellinbank. Sitting in fifth position – equal on points with Hallora in fourth – entering round 12, the Panthers could ill afford a repeat of last week’s poor performance against the second-bottom Neerim District. After winning the toss and electing to bat, Yarragon’s batsmen were simply irresistible and that all began with openers Gayan De Silva (78) and Daminda Rajapakshalage (29) who put on 73 runs for the first wicket. Great contributions from the middle order – the likes of Nuwan Perera (31), Gamini Kumara (37), Paul Harvey (43) and John Allsop (49) – kept the scoreboard ticking over for the Panthers in a performance that showcased their batting depth. Despite the best efforts of Ben Spicer (4/84), the Eagles were unable to contain their opponents and the Panthers posted the massive total of 315, leaving plenty of work for Ellinbank’s batsmen to do on day two. 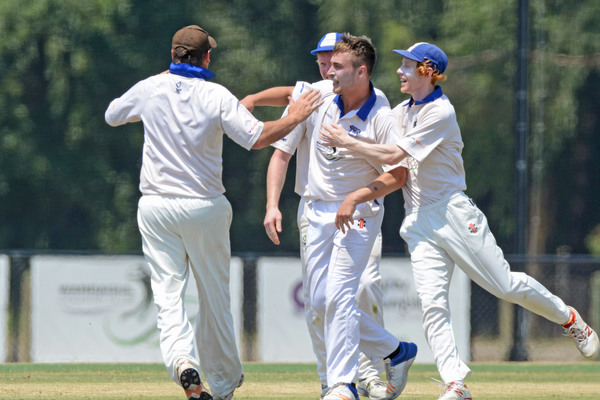 Buln Buln’s bowlers will need to perform extremely well on day two of their clash against the top-placed Western Park as they battle for their place in the finals. After electing to bat first, the Lyrebirds top order failed to fire as Jack Armour (0) was dismissed by Sam Batson (4/52) before getting off the mark and with Corey Jagoe (8) and Daniel Hamilton (8) also falling cheaply, Buln Buln struggled their way to 3/25. Jeff Walsh (16) and Brent Eastwell (20) somewhat steadied the innings, but when Walsh was dismissed by Troy Lehman (2/25), Buln Buln stood at 4/47. With the innings in disarray at 6/59, it was Max Kelly (44) and Harry Wans (26) who combined for an inspired 70-run stand to help put some respectability on the scoreboard. Batson continued to fire down deliveries and with help from Sanjaya Gangodawila (2/24), wrapped up the Lyrebirds’ lower order to have them all out for 161. With Western Park’s batting firepower, Buln Buln will have their hands full on day two attempting to defend their total. Drouin’s hopes of making finals are still very much alive after a dominant day one performance against Neerim District. The Stags only constant throughout their innings was skipper Jackson Ward (78) who battled manfully as others fell around him. Contributions from Kody Wilson (26) and Ashley Lockett (25) helped Neerim District a total of 168 in 47 overs. For the Hawks, Jamie Glen (4/36) and Simon Gardiner (3/44) were impressive and ensured the pressure stayed squarely on the Stags batsmen. In reply, Drouin got straight to work as openers Jonathan Bell (63) and Paul Timewell (23) combined for an 88-run partnership. The Hawks will resume play on day two at 3/96 after Ben Lockett (2/5) delivered four brilliant overs late on day one to give the Stags some life. Hallora put together a fine innings against the bottom-placed Jindivick in what is a crucial game for the Kangaroos finals hopes. After losing Grant Duncan (10) early, fellow opener Fraser Duncan (93), and Brett Williams (75) combined for a commanding 115-run stand as the pair totally controlled the innings and frustrated the Jumping Jacks. Gregory Interlandi (1/28) finally broke through to dismiss Duncan, but at 2/158, the Kangaroos were still very much in the box seat. Hussain Ali (7/74) was the star of the day for Jindivick and without him, the Jumping Jacks would’ve conceded even more than the 299 runs that the Kangaroos put on the board. Despite Ali being on fire, Drouin’s depth shone through and 58 combined runs from their final three batsmen – Aidan Phillips (20), Captain James Williams (19) and Craig Byrnes (19 not out) – was a key to their big total.